Attic Insulation Installation – Guaranteed Performance! Energy loss from a home is unfortunately inevitable. The forces of equilibrium, the physics of nature, continually strive to balance the heat energy on the inside, with that on the outside. Even in the best built houses, when the heating or cooling system goes OFF, the inside and outside temperatures immediately begin to equalize. 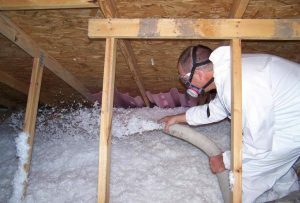 Attic insulation helps to make energy loss from a home as slow as possible, to minimize the amount of time the heating or cooling system must be on to keep the temperature within a comfortable range. 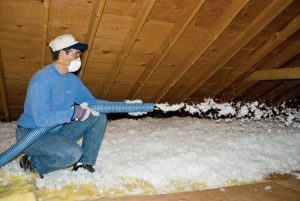 To help achieve this objective, attic insulation is used to control convection. In our part of the country the D.O.E. recommends an R-49 to R-60 insulation level in your attic (16”-21” deep). One of the most effective ways to increase thermal efficiency is to minimize convection by keeping cold air “out of circulation”. The principles of convection are important to understand both to minimize its undesirable effects, and also to better explain preventative measures. Convection is the transfer of heat via the movement of air. Hot air is less dense than cold air, so it tends to rise; the denser cold air tends to sink. In winter, currents of hot air rising and cold air sinking, are created within the home by the heating system (hot air rising), and by heat loss through conduction and air infiltration (cold air sinking). The better a home is insulated and the more effectively air infiltration is controlled, the less convection there is inside the house. The interior air is allowed to approach a state of equilibrium, and the temperature within the home remains more uniform. 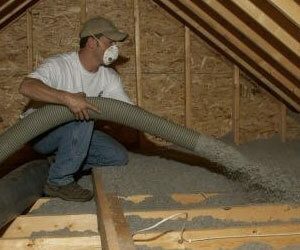 The attic insulation must be applied at or above the correct density for the desired R-value. The attic insulation must be applied at or above the specified minimum thickness for the desired R-value. As a qualified thermal efficiency expert, Clear Choice Energy Solutions has a significant investment in equipment, materials, and training to insure that each job is individually engineered to provide the stated R-value at the specified thickness for the insulation that is chosen. If the loose-fill is applied at the correct thickness, extensive testing has shown that it will be dense enough to achieve the specified R-value. This testing enables manufacturers to label their products accurately, beyond all FTC requirements. In addition to attic insulation, we also offer attic door insulation solutions. Since much air escapes through the attic door, this area is just as important.